Young men see life in terms of high peaks and deep valleys. Maturity tends to level the graph, with the peaks and valleys made more plain by experience. The highs aren't as intoxicating, but neither are the depths as devastating. 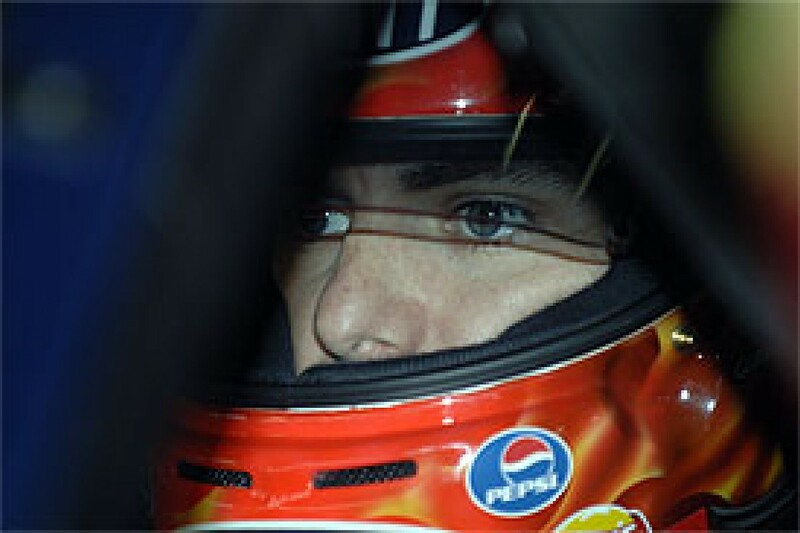 Since he turned 30, Jeff Gordon seems to have lingered somewhere between youth and maturity, but the maturity comes forward when Gordon looks back at 2005, the worst season since his 1993 rookie year, at least by his standards. With a handful of races left in the season, Gordon stood 15th in points, despite winning four times, bringing his career total to 73. 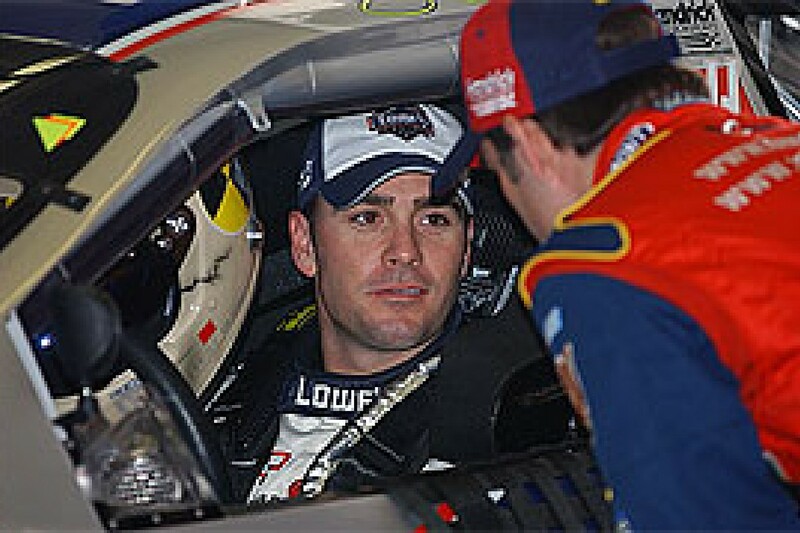 More important, at least under current rules and formats, Gordon failed to make NASCAR's championship playoff, the system that likely cost him a chance at his fifth NASCAR title in 2004. "When I talk to family and friends, people who mean a lot to me, and I talk about life, my life is amazing," he began. "I'm a competitive person, and this is a competitive sport. I don't like running at the back, I don't like being 15th in points. But at the same time, I'm a realist. "I realize you're going to have down years. I've gone through an amazing stretch of great runs, and I'm not done with those good runs yet; I feel like I've got more left in me. I'm also not going to let a year like this. To me, a year like this challenges me to find my inspiration, find how much I want it and how much this team wants to stay on top. "It humbles you a bit. It can happen to us, it can happen to anybody. Don't think I live and breathe what happens on Sunday every day of my life. I don't. I've had too many good things and too many good years to let that happen." What the dismal ending to 2005 also allowed Gordon and group to do is to lace up the sneakers and get a fresh run on 2006. 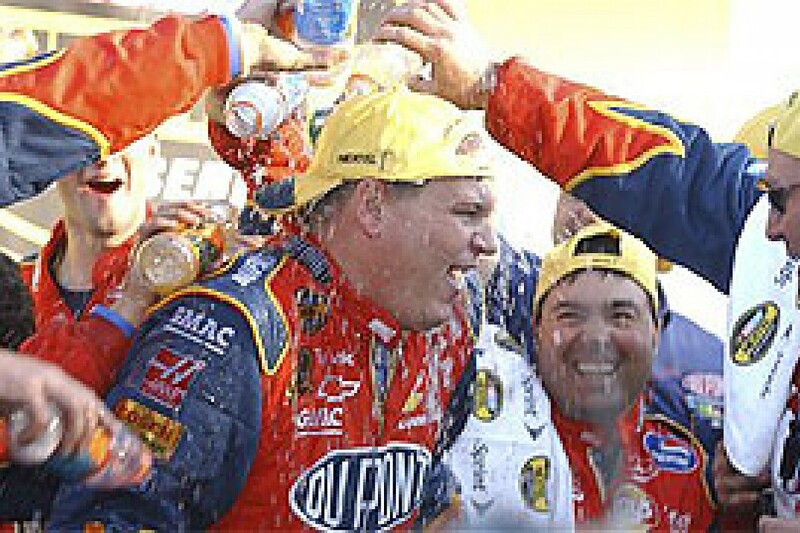 Almost immediately after the Richmond race in September, where Gordon's playoff hopes ran out, the team made a long-planned change, promoting car chief Steve Letarte to crew chief and moving Robbie Loomis to other duties. Loomis, as planned, next year will return to Petty Enterprises as general manager, so all the pieces in the scheme, discussed among the principals for about a year, seemed to slide into place without great grinding of gears. Loomis had done a good job as successor to team founder and Gordon mentor Ray Evernham, who left in late 1999 to take over DaimlerChrysler's (Dodge's) stock car program. Evernham will field three cars in 2006, for Jeremy Mayfield, Kasey Kahne and Scott Riggs. Under Loomis, Gordon won 24 races and the championship in the tragic season of 2001, when Dale Earnhardt died at Daytona and terror attacks struck New York. Loomis, modest and somewhat country in manner, always downplayed his role, but it was vital and integral. Loomis had expressed in late 2004 his desire to get off the treadmill, the 24/7 demands on the crew chief of the best team in NASCAR. He, Gordon and others in the organization pointed to Letarte, a 26-year-old from Maine, who, like his driver, is something of a wonder himself. A good organization can become hidebound, even amid success. Many in the organization say the time had come to break some patterns, let in some air, wind the watch to a good strong tick again. "We decided we wanted to put Steve on top of the box with Robbie, seeing how that works, knowing he was going to be the crew chief next year no matter what," Gordon explains. "With us not making the Chase, Robbie was one of the first to say, 'Do we want to make the change now?' We all agreed it was the best thing. These 10 races are going to be so valuable. "A lot of it's just chemistry, the chemistry of the people, being inspired and excited about nuances, a new crew chief, changes in the pit crew. That's what I see. We've got energy, got excitement, got fun things happening, so we enjoy what we're doing." Perhaps most galling to Gordon and group was that his No. 24 arguably was the worst in the Hendrick Motorsports harness this year, in terms of performance. Even the No. 25, with sophomore Brian Vickers at the wheel, and the 5, with freshman Kyle Busch, ran better at many stops. The Hendrick group, simplified, operates with central engine, build and fab shops. Gordon's 24 team and Jimmie Johnson's No. 48 are paired in one building, with Brian Vickers's No. 25 and Kyle Busch's No. 5 in another. All, of course, have access to the parts, technology, test results and intelligence. In a way, though, that contributed to Gordon's bind-up in 2005. There was a tendency, he said, to believe that because the co-housed 48 team was performing at top level, and that both teams were using fundamentally the same cars, success was simply a matter of tinkering the 24's setup to Jeff's satisfaction. "The last resort is cutting bodies off the cars," Gordon says, laughing. "You build cars, you don't wreck 'em, you basically end up bringing them back and trying different setups, different combinations, and just keep going in that direction. "That comes from a veteran crew chief, not from a 26-year-old guy who just came in. That helps me know I've got time to fill that confidence out." Actually, Gordon knew by May that it wouldn't be a good season. He had won three races by then, including his third Daytona 500, plus the restricted race at Talladega and the short track event at Martinsville. Elsewhere, at unrestricted ovals, he knew he was in trouble. Without going into averages, which are skewed by wrecks and a blown engine, Gordon stumbled through the second half. From Daytona until his dash for cash at Martinsville in October, he led just 29 laps in 17 events. The deep hollow came at Richmond in September. He arrived 12th in points, just 30 away from a spot in the top 10, and needed perhaps a top-five to snare a playoff spot. Gordon never was close. He muddled most of the way, hit the wall, and finished two laps down in 30th. "The only way to be in the Chase is if you earn it, and the bottom line is we didn't earn it, whether it was bad luck or didn't run good enough or I didn't drive good enough," he admits. "I'm more disappointed in how we ran than I was about not making the Chase. "We weren't good enough to get in the Chase, and we certainly weren't going to be good enough once we got into it to win the championship. It was kind of a relief." Another difference between young men and older ones applies especially to NASCAR drivers. When you're 22, 23, in your second year in the sport, racing is No. 1, and there are no Nos. 2, 3, 4, 5. With success and notoriety however, come increasing demands, and, at times, it's difficult to keep the order straight. Gordon, in addition to being equity partner in Hendrick Motorsports (he is listed as owner of Johnson's No. 48), has business interests of his own and a very long to-do list involving Hendrick sponsors, team sponsors, NASCAR-related appearances, media duties, and so on. Gordon, over time, has done well in structuring how he handles his business, but he admits to being stretched. The inevitable question for him each year is, are you pulled too thin? Are you trying to do more than is good for you? "Some things affect me more than I think they're going to and other times they should affect me more," he notes. "I stay so busy. This is one of the hardest-working years I've had, on and off the race track. Sponsorships come along that might be a Hendrick Motorsports sponsorship, and I've got to do a couple extra things here. Most of the things I do endorsement-wise, I try to limit the amount of time it takes for me. If you want to use my likeness, how do we structure it to where I don't have to physically be traveling a lot? I think we've got that down pretty good." He admits that some obligations this year "overlapped to where I was running myself too hard in the middle of the year." But he quickly adds, "I do think there's times I'm too busy, but no, I don't feel like that kept us out of the Chase." The team changes are the first and most obvious step. The team also has begun a concerted test program to put the 24 back on the rails, beginning at Atlanta in late October. "We need a good strong finish at those mile-and-a-halfs," he stresses. "I was happy with the way we ran at Kansas and Charlotte. I'm not saying we have to win, but if we come out of there with a top-five, we're definitely looking at some improvement, a lot of improvement. "Each time I go into the off-season, no matter what kind of year we've had, I'm always very optimistic. And when it's all new, our chances are good. A lot of times when you get in a rut, you lose a little confidence and it's hard to get back up, but when you start the season out, it's easier to start up here and maintain it. "Our team's better than what we've shown here recently. The way things are going right now, I think we've got a strong team, and we're only going to get stronger in the off-season. Letarte's job title may be new, but he's a veteran at Hendrick Motorsports. When Steve Letarte was appointed crew chief for Jeff Gordon, Sept. 12, I had to call Hendrick Motorsports to be sure I was reading right. The official release said Letarte, 26, had worked for the organization 11 years. "That's correct," spokesman Jesse Essex said. "He started with us when he was in high school." Letarte, from Cornish, Maine, is a big boy with a football build, an avid skier. His father Don, having received a paying job with Hendrick's in North Carolina, pulled up stakes, Steve included, and headed south in 1995, when Steve was 15. "Then you realize every time you put a task on top of him, he exceeded it." Stevie (as he's known within the team) started as a parts assistant, moved to tire specialist, then general mechanic, then car chief in 2002. He's been there for all of Gordon's championships and most of his great triumphs. If ever there were a natural selection, this appears to be it. So it's not like being pitched off the deep end. 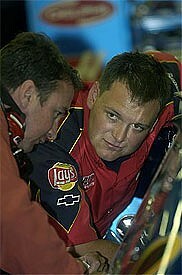 Letarte was at the head of the list to replace departing Robbie Loomis as big chief, with the ETA being 2006. He spent most of 2005 on top of the box with Loomis, watching, learning and training. "It's just like any other position I've ever gained," Stevie insists. "What you think that position is responsible for is about half of what it really is responsible for. Every day and every week, I'll probably get a little more responsibility." The good news is that Gordon, Loomis and management agreed to make the decision early, after failing to make the championship playoff with 10 races to go. That gave Letarte time to suit up and get on the field, running up to 2006. "Everyone around me has stepped up to help me every day," Letarte says. "That's the beauty of this 10-race deal." Letarte responded with a gutsy call at Martinsville, leaving Gordon out on old tires late in the race for the track position that won him the race. That's the kind of thinking Gordon appreciates. He also likes Letarte's willingness to take charge of the cars, rebuilding if necessary to make Gordon more comfortable. "We're not going to look back," he says quietly. "We're just going to use the 10 races to really try to build."